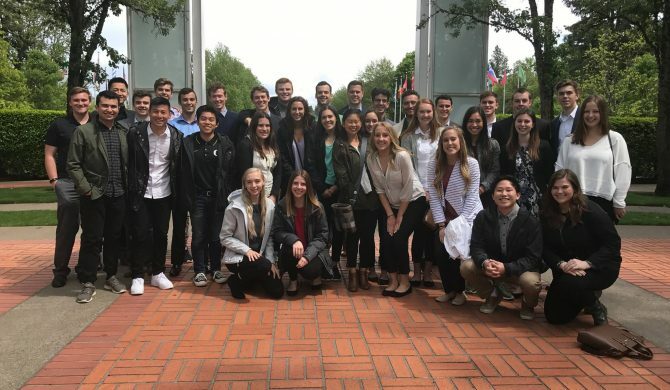 In May, members of the Lundquist College of Business Honors Program were invited to Nike World Headquarters in Beaverton, Oregon for a campus tour and panel discussion with long-time Nike employees. The tour included visits to numerous buildings dedicated to the different departments that make up the Nike brand. Some notable buildings included the Michael Jordan building and Prefontaine Hall. It was amusing to hear about Nike’s humble beginnings making sales out of the back of a van in Eugene. The storytellersmdash;as Nike fondly calls their guides—gave students insight into how the campus and numerous intramural clubs, courts, fields, and gardens all contribute to Nike’s incredible business culture. The stories of sports legends like Mia Hamm and Jerry Rice demonstrated Nike’s culture of treating its sponsored athletes as part of the team. Students explored the many food options available during their lunch break, during which they shared what they had enjoyed most about the tour and what they had learned about Nike’s history. Nike’s cafeteria space provides employees with a place to come together and interact over lunch, creating an exciting and vibrant atmosphere. After lunch, students attended a panel discussion comprised of Nike employees, the majority of whom were part of the golf division. The panelists included Aaron Heiser, David Pearce, Collette Hemmings, Jarod Courtney, and moderator Heather Broderick. Each panelist shared the story of their career paths and the challenges that they faced along the way. Many of the panelists had experienced career journeys best described as nomadic, experiencing Nike’s global reach by landing positions in the U.K., Europe, and Asia. Another aspect of Nike life the group discussed was how interconnected the business culture is to their everyday activities. Each panelist discussed the Nike company value that spoke to them most and that they keep in the back of their mind to help guide their way through decisions and challenges. During the Q&A portion, the panelists were candidly open and honest about their experiences. From the closure of the golf equipment sector to the struggles of following your career in unfamiliar places, their stories resonated with students on both a mental and emotional level. To conclude the day, Honors Program students received access to the Nike company store, where they had the opportunity to purchase merchandise and further mingle with their peers. All students left full of insightmdash;many left with bags full of Nike gear as well. Story by Liam Jacobs and Nick Miller, 2016-2018 Honors Program cohort members. Jacobs is a business administration major, concentrating in sports business with a minor in economics. He will spend this next school year as a marketing and promotions intern for UO Athletics, and graduates in spring ‘18. Miller is a business administration major with a concentration in finance. He is also pursuing a second major in economics. This summer he will hold a position as a summer analyst at Ascent Private Capital Management, a subsidiary of U.S. Bank, in San Francisco. Miller will graduate in spring ‘19.